Waking up to the sound of the telephone ringing, I sauntered over to the little balcony in our bedroom overlooking the tiny woods in my backyard. The windy morning was beautiful. Yellow leaves floating gracefully to our wet deck. The smell of rain. A fog in the making. I realized with a smile that it was five years to the day we moved in. The charm of a new home worn away to be replaced by a warmth and familiarity etched from everyday events. Watching the seasons change for the umpteenth time since we moved I was touched by the beauty that surrounds me. A Saturday morning like every other, I sit sipping on my coffee, chatting with Amma. Nothing is different yet everything seems to be tinged with newness. It’s the time of the year I conclude when old gives way to nothingness and then we wait for Spring. For life to begin. All over again. I love it – especially framed by your beautiful window. Fall is beautiful, I think, despite the fact that more people like spring. Lovely foliage, your window is like a screen saver ..time to Fall back and relax we can wait to Spring forward in a few months..
One can never have enough of these colors.. what a gift from Mother Nature. Congratulations on the fifth anniversary of moving into your home… wishing you more warmth and fond memories in the years to come. high five for the 5th year! Corner office can beat this view too with a blast! That is a beautiful photograph, a beautiful view and beautiful thoughts! in some ways, i think nature gives something for us to enjoy before the drab of winter sets in. 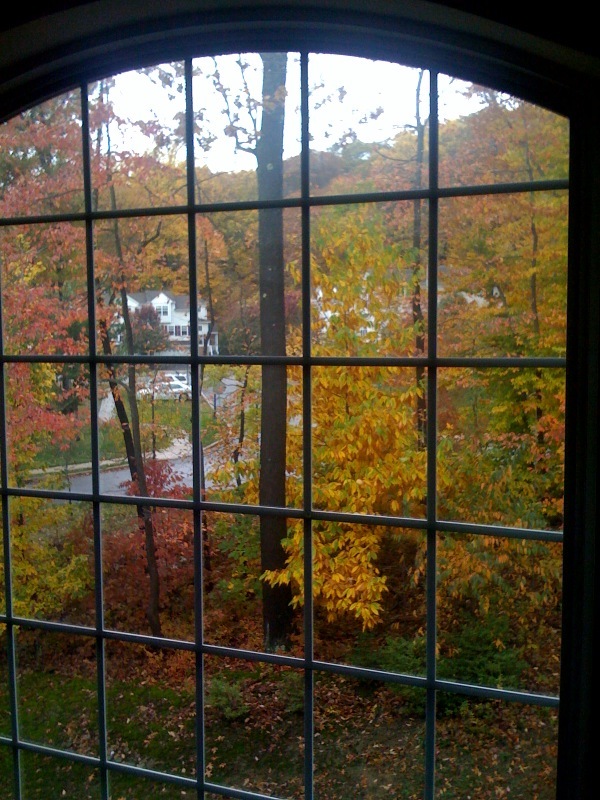 The trees in our lawn are among the last ones to change color.